Study: 'The Blob' was a product of weather patterns and El Niño | Watts Up With That? The Northeast Pacific’s largest marine heatwave on record was at least in part caused by El Niño climate patterns. And unusually warm water events in that ocean could potentially become more frequent with rising levels of greenhouse gases. That’s the findings of a new study by researchers from Georgia Institute of Technology and the National Oceanic and Atmospheric Administration. They linked the 2014-2015 marine heatwave – often referred to as the “warm blob” – to weather patterns that started in late 2013. The heatwave caused marine animals to stray far outside of their normal habitats, disrupting ecosystems and leading to massive die-offs of seabirds, whales and sea lions. The study, which was published July 11 in journal Nature Climate Change, was sponsored by the National Science Foundation. The researchers traced the origin of the marine heat wave to a few months during late 2013 and early 2014, when a ridge of high pressure led to much weaker winds that normally bring cold Artic [sic] air over the North Pacific. That allowed ocean temperatures to rise a few degrees above average. Then, in mid-2014 the tropical weather pattern El Niño intensified the warming throughout the Pacific. The warm temperatures lingered through the end of the year, and by 2015 the region of warm water had expanded to the West Coast, where algal blooms closed fisheries for clams and Dungeness crab. 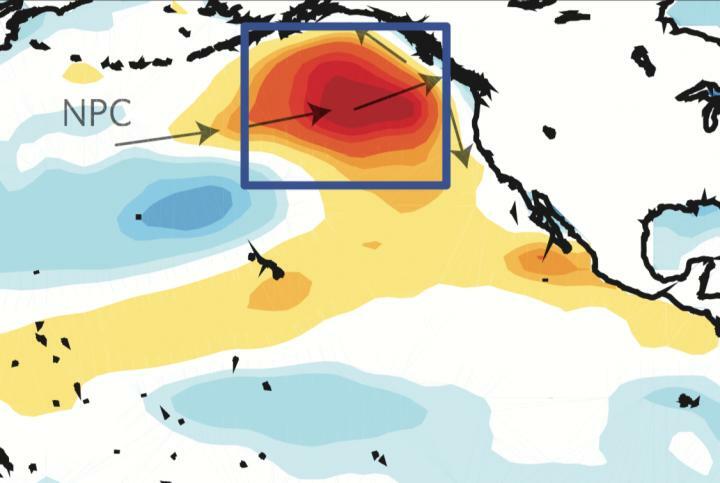 “The bottom line is that El Niño had a hand in this even though we’re talking about very long-distance influences,” said Nate Mantua, a research scientist at NOAA Fisheries’ Southwest Fisheries Science Center and a coauthor of the study. The researchers used climate model simulations to show the connection between increasing greenhouse gas concentrations and the impact on the ocean water temperatures. The study found that these extreme weather events could become more frequent and pronounced as the climate warms. And the effects of the “warm blob” could linger. This material is based upon work supported by the National Science Foundation under Grant Nos. OCE 1356924 and OCE 1419292. Any opinions, findings, and conclusions or recommendations expressed in this material are those of the authors and do not necessarily reflect the views of the National Science Foundation. CITATION: Emanuele Di Lorenzo and Nathan Mantua, “Multi-year persistence of the 2014/15 North Pacific marine heatwave,” (Nature Climate Change, July 2016). July 13, 2016 in Climate News. ← Senator Whitehouse goes Full Conspiracy Theory on "Climate Denial"
So how do you propose to find out if a new blob will happen somewhere else and at some other time?? Oh, excuse me, I thought you were talking about climate; but from your statement I see you only want to find out whether ” studies ” will become more frequent. I would say rather unlikely once people realize the scam you are running. I can’t imagine a more complete disconnect between rising greenhouse gases and ocean water Temperatures in one small spot on the globe. “Heat” (noun) goes from hot to cold (places), and hot (adjective) air goes up; not down. Seems like the blob should be going up into the atmosphere, not coming down from space. Wake me when you predict a blob off Miramar Beach at Half Moon Bay, so I can remember to take my swimsuit with me, when I go walk there. An interesting question comes to mind: at what speed must a warm mass of air stay below while flowing over a cool body of water such that the water temperature will rise rather than drop due to evaporative cooling? At that slow speed it’s the only way “CO2 warmed” air can warm a body of water it passes over. The blob just ate my post. That seems to happen a lot. Not quite 97% of the time, but often enough for me to not even bother to send it. And I notice that the blob has an anti-blob right next to it. Do the CO2 dunnit models describe how the anti-blobs are caused ?? Please don’t question any anti-blobs, more tax money is required to answer that. They have been working on climate assiduously for over 30 years, at a cost of billions of dollars, and at least a decade ago declared that the science was settled. So when did they predict the blob? They didn’t. When did they predict the latest El Nino? They predicted that it would come a year earlier and had to re-predict it for the following year. When did they predict the recent 18-year “pause”? They didn’t. When did they predict the record Antarctic sea ice? They didn’t. Etc, etc, etc. The science is settled? Total baloney. Never before have I witnessed such an absolute shower masquerading as scientists, and such an utterly corrupt bandwagon. Is a model still a model if it can only be used to understand the past? Shouldn’t a model, philosophically, have some predictive ability? I’d bet Dr Curry did not sign off on that hot PR blob. I’m hoping KNMI will update through June the Reynolds OI.v2 data today. I just posted the June 2016 SSTa update. 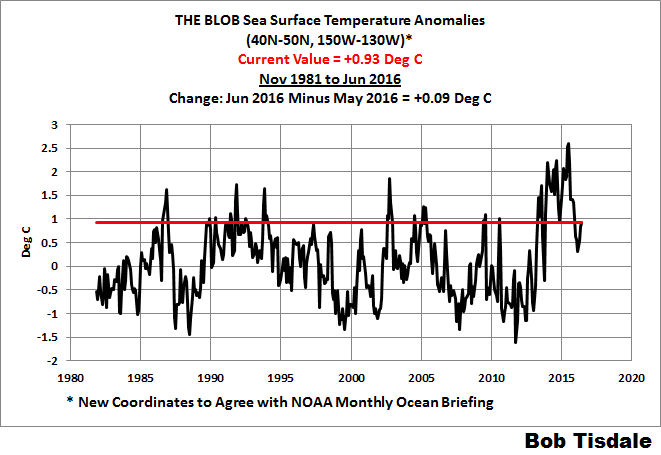 The sea surface temperature anomalies for The Blob made another uptick in June. Bob, have you seen this new app from the UW climate department? It allows you to monitor buoy sensors located in the vicinity of the blob. As expected Bob from Spotless weak/sun end of June. Do you know what explanations exist for the absence of warming trend in a blob region at the time then surrounding regions were warming? :Events like this contribute to species dispersion, the first step to more diversification. More diversification is bad too… like grolar bears. Nothing good ever comes from the possibility of AGW. But nobody knows if the ‘average temperature’ of the oceans stayed constant over that 4 years and merely distributed contained heat differently, or whether there was a higher than usual input of heat from some source such as the amount of received sunlight able to heat the oceans. It does not seem fruitful to model hot spots as is done here, without knowing which of the 2 broad possibilities above applies. Mechanisms trump models. A bounded random walk fits the bill pretty well I think. The statement “And unusually warm water events in that ocean could potentially become more frequent with rising levels of greenhouse gases.” is a highly hypothetical and not based on facts but part of fiction. In fact, this “unusually warm water events in that ocean” had nothing to do with greenhouse gases. It was just weather. I am not convinced that DLR, which is real, can cause much warming to warrant the CO2 alarmist concerns. The ARTICLE PREVIEW says nothing about the impact on mortality rates of seabirds, whales and sea lions. I am wondering what evidence they have to prove the claim about massive die-offs. Are they inferring it from models, or is there actual physical evidence such as bodies? There is no scientific basis for stating that CO2 had anything to do with the RRR. (Ridiculously Resilient Ridge) that was primary cause to both the “Blob” and the California drought. California has had many droughts, prior to humans driving SUVs; which were far greater deeper and longer then the recent drought. Similar weather patterns and jet stream patterns in the 1970s were attributed to the coming “ice age”. I have some compassion for many so called scientists, who worked and studied hard, and who’s careers depend on linking weather to CAGW. The declining blob may strike back at warmists, as it worked in conjunction with the El Niño to elevate SS records to new recent highs. Likewise, if it continues to decline it may well bring down GMT more then the usual swing away from a strong El Nino. Indeed, the declining “Blob” may be responsible for the narrow breath (relative to the wider longer warmth shown in 1998) of the 2015/16 El Nino’s warmth as shown in RSS and UHA charts. Examples of dramatic species range shifts in summer and fall 2014 that have come to our attention include the following: (1) a skipjack tuna caught near the mouth of the Copper River in July [Medred, 2014]; (2) ocean sunfish and a thresher shark caught in summertime surveys off the coast of SE Alaska, where distributions of juvenile salmon and pomfret were also much different than usual (W. Fournier, personal communication, 2014); (3) a record high northern diversion rate of Fraser River sockeye salmon, i.e., the proportion of adults returning around the north versus south side of Vancouver Island [Gallagher, 2014]; (4) rhinoceros auklets in British Columbia preying on Pacific saury (associated with subtropical waters) rather than sand lance (associated with subarctic waters) in summer (J. Zamon, personal communication, 2014), (5) high catches of albacore tuna near the coast of WA and OR during summer and fall 2014; (6) juvenile pompano collected during surveys near the mouth of the Columbia River in summer (L. Weitkamp, personal communication, 2014); and (7) widespread strandings of Velella from British Columbia to California in July and August. There was also a massive influx of dead or starving Cassin’s Auklets onto PNW beaches from October to December 2014 [Opar, 2015]. The list is much more illustrative than comprehensive but does suggest that the physical oceanographic conditions had substantial and widespread impacts on the ecosystem. The full ecosystem response remains to be determined, but it is liable to be profound, as occurred in the California Current during a period of weak coastal upwelling in 2005 (Warm Ocean Conditions in the California Current in Spring/Summer 2005: Causes and Consequences, GRL special issue, 2006). of Fraser River sockeye salmon. sure. How could we make it without peer review. Perspective on the Blob: Studies of fish scales and otoliths from cores taken in the Santa Barbara (California) basin show a pattern of repeating (putataive) warm water incursions over the past 1500 years. The were (are) known as Davidson periods and corresponded with the rise and fall of sardine populations along the California coast. Local fish moved as far north as Oregon and Washington and aquatic fauna from from the latitude of Cape San Lucas (Cabo San Lucas, Mexido) were found north of San Francisco. Afterwards the sardine populations failed and were replaced by engaulids (anchovy) for long periods of time. A recent example is the failure of the California sardine fishery in the 1940s. The explanation offered was a change in the position of the Alaska low pressure area which allowed the jet stream to move northward, the prevailing NW winds along the Pacific West Coast failed and water moved offshore dragging warm water up from Mexico into the “vacuum”. That was then (1950s). Now we have el nino and climate change. The warm water blob is not a new phenomenon – better measured now, better presented graphically, but not new and its predecessors over 1500 years were not caused by ACC. Peter, no need for “vacuum”. Us layman can go with “low pressure” aka hypotension. science community may develop a ‘peer wiki’ analog german Guttenplag wiki. Could potentially??????????? I guess that ‘s to ensure they do not upset the grant givers. beat me to: Maybe science community can. Sure denialists won’t loose an echo chamber / won’t do it. won’t loose -> don’t want to loose. not a typo, plain outlandish. And here it is, just three weeks short of midsummer and the Western Pacific has not yet seen a typhoon, nor has the Indian Ocean. However, the Eastern Pacific has seen a conveyor belt of tropical cyclones developing off Mexico and wandering out toward the Hawaiian Archipelago. Tells you where the heat is. In the Atlantic, not much prospect for hurricanes yet this season. Not enough heat to support that kind of weather.. Here is a nice little pic of what may be the lineup for the 18th. They seem to gain intensity to the middle of the track, and then dissipate out by Hawaii. Where did the heat go? Cyclones in the Indian Ocean and Bay of Bengal. There was a typhoon in Taiwan several days ago. Steve Fraser: Joint Typhoon Warning Center(http://www.usno.navy.mil/JTWC/) hasn’t reported even a TD in many, many weeks. Homo sapien subspecies Liberal dumbassitus adapts by demanding more of OPM. But I feel an oncoming cold wind, which perhaps may possibly could send them scurrying back into their holes. Coffee in nose and on computer screen. Too funny! Liberal dumbassitus. Brilliant! I am so glad that I swallowed by soup and put down the bowl before I read your post! Clam chowder on keyboard is not good for my demeanor. liberati; slang for, “Reserved intellectual who reads but mostly writes breakthrough thoughts. Sits in cafes with notebooks sprawled everywhere. Likes blazers and grandpa’s closet. “The researchers used climate model simulations” Stop right there. The “researchers” might just have well have used play dough and magic markers. So in other words, it was weather. The only link to CO2 was via models, not reality. I feel the Blob is mostly Solar cycle forced. The blob and prolonged spike in the +PDO I feel is mostly caused by the weakest solar cycle #24 in over 200 years. Weakest solar cycle in 200 years I feel has been causing a LIA like pattern in Great Lakes and NE. During 13-14 and 14-15 winters two back to back years of record ice on the great lakes occured. If you look at all the big great lakes ice years going back 50 years, Big great lakes ice years have not occured near a solar cycle peaks and only near the bottoms of thrsolar cycles when the PDO spikes. Same pattern was in place during the 15-16 winter but the strong ElNino basically overwhelmed it with waves of moist air . I have been studying solar cycle #24 with Global SST’s , Global surface temps and Arctic temps for many years now and it is an amazing cycle to watch unfold. I started seeing 3-5 day lags in global temps rises or dips with increases solar or decreased solar activities when weather static is low. One would think when solar activities rise air temps or SST should rise but it is the other way around. Solar rises = Temps fall and Solar falls = Temps Rise. I wish someone like Bob T could do some charting on daily solar and global temps with regions and chart solar cycles with Great lakes ice years. An older great chart that Joe D at Wxbell made a while ago. I use it all the time in tweets. As a “feeling” amateur scientist, you are obligated to rule out the first encountered pathology before jumping to speculation. The blob may be the result of weakened winds augmented by circulating left over El Nino water. These intrinsic processes have internal variability thus may not care what the Sun is doing. Stronger solar equals colder? Now that’s a new one. My advice? Que the solar enthusiasts and dodge quick! Before these researchers used these computer models, did they check the simulator test results first? A bit like your anaesthetist not checking they have full bottles of oxygen and halothane (what ever) prior to a long medical procedure. If these researchers did not check the simulator signoffs before use then all of their work, time and effort was wasted. It follows the usual pattern: Warm is climate change, cold is weather. The cold spot in the North Atlantic is just weather. Nothing to see here move on to the hot spots. To me the key question is: why is the blob location geographically static? – because the western mexican shore is geographically static and that b**ch of a sun predictably moves back over head dayly east/west? There is always an explanation for anomalies in science. The trick is in figuring out how CO2 caused it. If there is no smoking gun, creative speculation has to suffice. One could also speculate with alternative natural explanations/theories……….but .the science was settled over a decade ago. So we know to start with the assumption that increasing CO2 was somehow responsible.. Thank God for the Blob. It made for a couple of nice summers and winters here in Southeast Alaska. Of course the salmon run was poor, hmm wonder if they’re related. On balance, I would opt to keep the Blob going. Would it help if I kept the bonfires going all year? Thank you WUWT, I enjoy this site. What was going on in the late 50s and early 60s? Unusually warm water events in that ocean are more frequent in solar minima. There is a great analogue of the same kind of blocking setup from late 1875 to late 1878.